A 50mmn diameter football medal in silver finish, supplied in a 3.5in hinged blue medal case. 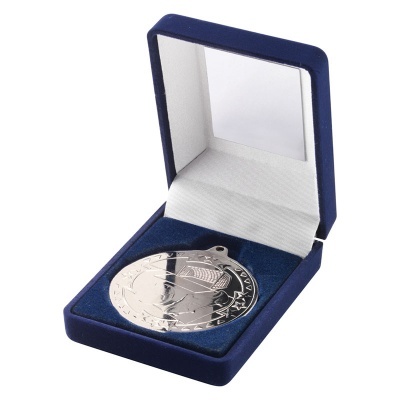 The front of these versatile medals has a football scene including a football boot, goalposts and a ball. They are suitable for both men's and women's football awards. Engraving will be provided on the reverse of the medals. Gold and bronze versions available. 50mm dia bronze finish football medal in 3.5in blue medal box. 50mm dia gold finish football medal in 3.5in blue medal box.